If you take part in Twitter Chats and sometimes find it hard to keep track, then you may like to use Twubs. It’s a web-based tool that enables you to follow the conversation via the Chat’s hashtag. 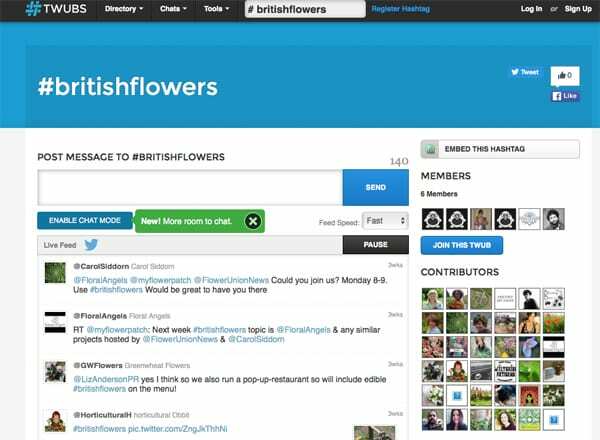 For example, #BritishFlowers. This particular hashtag is used for a Twitter Chat, which takes place on a Monday evening from 8pm-9pm. One big advantage of using Twubs is that you can vary the speed that the tweets appear, with the option of slowing down the pace. And you can also pause the feed, as you can see in the image below. For more information about this useful tool, simply head over to the Twubs website.